STALITE's strong end-use products begin with the production processing of our raw material slate. 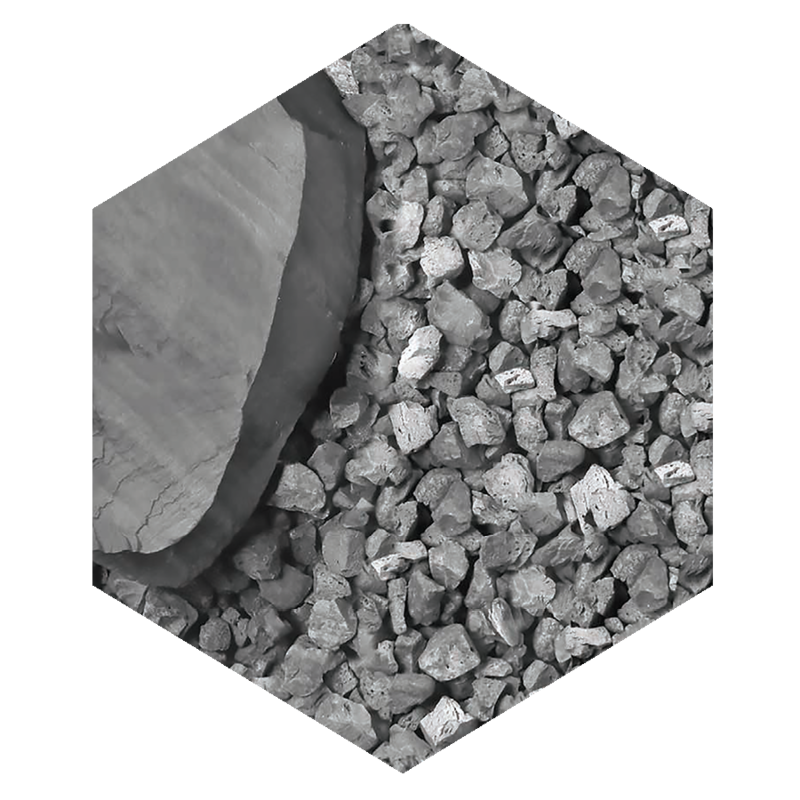 Slate possesses the high strength and lasting durability necessary to create a superior lightweight aggregate. Unlike shale or clay deposits formed from mineral or organic sediments, the slate used in STALITE was formed from volcanic ash. This volcanic ejecta, free of impurities which were burned away at very high temperatures, was deposited in a wet environment and compressed under extreme pressures for millions of years. Several types of raw material can be expanded in a rotary kiln to produce structural lightweight aggregates. These materials can be classified as clays, shales and slates. The primary difference in these three classifications of materials is their strength, density and absorption. Clays and shales are naturally softer, and less dense than slate. After processing in a rotary kiln, clays and shales have 24-hour absorptions ranging between 15% and 30% (compared to 6% for STALITE). During mixing or pumping concrete, clay and shale absorptions can be as high as 50% (compared to 9% for STALITE). Due to the higher material strength of STALITE slate aggregate, higher strength concretes can be achieved with lower cement contents allowing for more economical concrete mixes. BEGIN STRONGER = END STRONGER. The raw material mined by STALITE is an argillite slate located in a geological area known as the Tillery Formation. It is a thinly laminated, gray, fine-grained siltstone, composed of clastic (transported) rock fragments. The Tillery Formation is a complex system that must be selectively mined in order to separate the desirable product from the non-desirable to manufacture a high quality expanded slate aggregate. The geologic history of the Tillery Formation began 550 million years ago in the Cambrian Period, approximately 330 million years before dinosaurs. Rock fragments of volcanic ash origin were deposited in a water environment (sedimentation) and later solidified into solid rock (lithification). Consequent burial and tectonic pressure then changed (metamorphosed) the rock into argillite slate. Along with the deposition of the volcanic ash was an occasional ash (debris) flow or gravitational mud-type flow into the same deposition basin. Additional layers, consisting of volcanic tuff with high calcite concentrations, formed within the system. Subsequent millions of years of geologic forces caused the alternating layers of material to fold and fault, causing disorder to the once ordered, layered system. Along with this disorder came diabase dike rock intrusions of Triassic-Jurassic age (about 180-220 million years ago), which caused additional rock structures of vertical emplacement that further complicated the system. The calcareous tuff impedes the bloating process of lightweight aggregate production. At 2,000 degrees F (1,000 degrees C), the calcite simply calcines. At high temperatures of over 2,200 degrees F (1,200 degrees C), diabase rock (specific gravity of 3.0) melts to a glassy type of rock with no specific gravity change. Because this high specific gravity creates havoc on a desired lightweight specific gravity material, it should be avoided totally. The only way to avoid this material is through a process of selective mining. Extensive core drilling must be performed along with microscopic, chemical, and laboratory test bloating of the core in order to “map” the subsurface material and identify desirable versus non-desirable aggregate. Computer software must then be used to identify high-quality cross-sections of desirable versus non-desirable rock zones. Mining computer software can then be used to design the selective mining sequence. A modern fractionation plant with controllable radial stackers and feed systems then crushes the high-quality bloatable material to optimum size for processing and separates it to be conveyed to the raw feed storage silo. STALITE uses a 3-D mapping process as a guide for selective mining of the slate that is best suited for the production of STALITE. The quarry’s location allows the raw slate to be efficiently conveyed directly to the rotary kilns. STALITE has confirmed reserves of raw material to supply our needs throughout the 21st century. After blasting, pit loaders are used to load the blasted rocks into haul trucks. Haul trucks move the rocks from the pit to the primary crusher at the processing plant. The primary crusher breaks the large rocks from the pit into smaller pieces. The primary crusher can crush between 300 and 2,000 tons per hour. As the rocks pass through the crushers, they are moved around the processing plant on conveyor belts. After crushing, rocks are broken down to smaller sizes and go through a screening process. By using various size screens, the crushed rock can be separated by size. Some screens are larger and they allow the bigger rocks to pass through. STALITE’s process requires rocks be crushed and screened several times before they are put in a stockpile with other rocks the same size. After being crushed to an optimum size for processing, the raw slate is fed into STALITE's patented pre-heater. The pre-heater conditions the rock before entering the rotary kiln. The pre-heater slowly heats the rock as it comes down to the kiln. The kiln is fueled by coal that is pulverized and blown into the kiln. In the kiln, the slate is heated to approximately 2,200 degrees Fahrenheit. As the slate approaches this temperature it becomes almost molten, like lava. In this molten state, the rock is plastic enough to allow gases to evolve, forming small, unconnected voids uniformly throughout its mass. The expanded rock then falls to the cooler, where it is air-cooled. When the expanded slate is cooled, the cells remain allowing for its low unit weight. Expanded slate aggregate is produced by the rotary kiln method. This discussion describes one specific lightweight aggregate manufacturing plant. Other rotary kiln process facilities are similar, but may have variations from the process described herein. The rotary kiln is a long tube that rotates on large bearings. The kiln is lined with insulation and refractory materials. Raw slate is fed from the storage silos into patented pre-heaters that allow the rock to heat up at a moderate rate. It then enters the upper end of the kiln where it slowly revolves and moves toward the “burn zone” near the lower end of the kiln. The “burn zone” reaches temperatures in excess of 2,200 degrees F (1,200 degrees C). STALITE uses high BTU, low sulfur coal and natural gas for its heat sources. Some lightweight aggregate production facilities use only natural gas, while others supplement these traditional energy sources by burning hazardous wastes. In the “burn zone” of the rotary kiln, the slate becomes sufficiently plastic to allow expanding gases to form masses of small, unconnected cells. As the expanded slate cools, these cells remain, giving the aggregate its low unit weight and low absorption. The expanded material, called clinker at this point, leaves the lower end of the kiln and enters a forced-air cooling system. This cooling process reduces the chance that the aggregate will crystallize as can happen in water-cooled systems where the very hot expanded material is dropped directly into a pit filled with cold water. From the cooler, the clinker is conveyed to a classification area. Here the material is crushed and screened to various size fractions. These different size fractions are kept separate until, by means of an automatically controlled blending system, specified gradations are produced for various applications. After blending, actual moisture content is automatically adjusted to a predetermined level. The expanded slate aggregate is then tested for proper gradation, moisture content, specific gravity and unit weight. After testing is completed, the expanded slate aggregate is stored or conveyed directly to trucks or railcars for shipment. Prior to loading, trucks and railcars must be inspected for cleanliness and washed when needed. A particular procedure is carefully followed when loading material from either the storage silos or the stockpiles to ensure that material consistency is maintained. A rigid quality control and testing program confirms compliance with the customer's specified needs. The cooled, expanded slate is conveyed to the classification area. There it is crushed and screened into different size fractions. After crushing, the different size fractions are stored in separate silos until they are blended into standard or custom gradation blends. STALITE's automatic controlled blending system accurately produces blends to meet the most stringent grading requirements for our customers. The moisture content is adjusted to a predetermined level. We then test the aggregate for moisture content, specific gravity, unit weight and grading prior to shipment. High quality, high performance structural lightweight concrete is essential in today’s high technology construction. Here are examples of STALITE's 3/4", 1/2", 3/8” gradations. 1.) Fine grades are stored in low-height silos that feature a unique perimeter port feeding system developed by STALITE to minimize segregation. 2.) Coarse grades are stored in low-elevation stock piles that feature a moisture control system. Ample controlled storage allows the company to supply on-time delivery. Environmentally Conscious – STALITE uses high BTU, low sulfur coal for its heat source. Fly ash and STALITE pozzolan are collected in high efficiency bag houses supplied by the StaClean Corporation. STALITE uses lime slurry misting and caustic systems to constantly scrub CO2 and other gases out of our air streams. These products are sold and recycled to concrete product companies as supplemental cementitious materials. STALITE uses state-of-the-art Controlled Emissions Monitors (CEM) and is continuously monitored by the North Carolina Department of Environmental Quality.